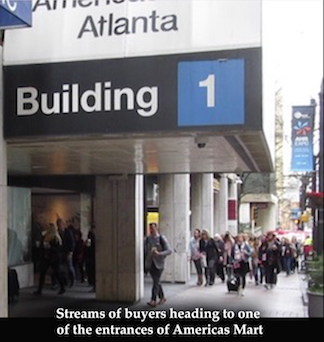 AmericasMart, the venue of the Atlanta International Gift & Home Furnishing Market trade show, has more than 1,400 permanent showrooms and the January 2019 show had 3,300 temporary booths exhibiting products. The AmericasMart article “AmericasMart Kicks Off Winter 2019 Trade Show Season With Energy and Optimism” stated that a strong holiday season and a positive outlook for 2019 drove significant buying at the show. Comment: It did look like attendance was up from last year and reps were very busy writing orders. The take over by a new company may impact the number of companies that are leasing showroom space at AmericasMart and those that rent temporary booths during the trade shows. An exhibitor that had a temporary booth at the show told me that the price for a booth has increased and that there were no chairs in the booth this year. They were informed at the show that if they want chairs, they would have to pay extra. On the other hand, there were improvements for buyers and those walking the show. 1. There were more chairs, benches and tables for buyers to use this year than previous years. Finding a place to sit to eat lunch, meet with other people, or just relax is always a problem at the Mart. 2. The AmericasMart app was upgraded. The Mart has a free WiFi and the app shows events, information about the companies and locations of the showrooms. It now has an easy way to find exhibitor showrooms and booths by using blue-dot navigation when using a device that accepts Wi-Fi (smart phone, tablet, computer). The location of a person is shown on a floor map and an arrow points to the showroom that the person requested. The arrow continues to change on the map as the person moves toward the showroom. This is a very welcome improvement because some of the floors are so large that the showrooms are hard and sometimes impossible to find. Positive retail sales is important for the future of artists to continue licensing art to manufacturers and earning good revenue. I believe that knowledge-is-power and that is the reason why I keep track on the health of retail sales by reading articles about them and the predictions for the future. According to the article “US retail sales rebound sharply in October” retail sales rose 4.6 percent. And, according to the eMarketer in the article “US Christmas sales predicted to surpass $1 trillion for the first time this year” . . . "marking it the strongest growth since 2011. This report comes amid concerns over the future of brick-and-mortar retailers, news of bankruptcy and store closures.” Comment: That means despite the concern by consumers and retailers that the U.S. might have a recession because of the economy sales of products in 2018 have increased. And, according to economic analysis and business strategy expert Kimberly Amadero in the article “US Economic Outlook for 2019 and Beyond” the U.S. economic outlook is healthy according to the key economic indicators (gross domestic product growth rate, unemployment, inflation, etc.). Amadeo predicts that even though the economic outlook is healthy "2019 will experience subdued economic growth, although a recession is unlikely." Note: Not all companies exhibiting at the Atlanta Show use art on their products. When they do use art, they may not license it but purchase the art outright or use their own in-house designers. Below are examples of trends seen at the 2019 Atlanta Show. These photos were taken in public areas of AmericasMart were filming is allowed without permission by the company. 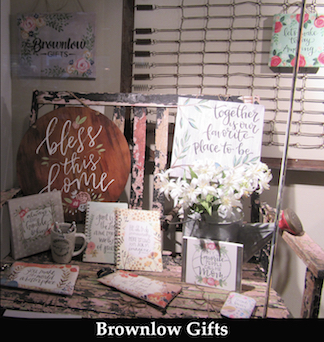 Brownlow Gift (www.brownlowgift.com), C and F Enterprises (www.cnfei.com), and Studio M (www.studio-m.com) photos are the only companies that license art. The following discussion about trends refers to those that relate to licensing art such as themes and colors. Thus, trends in product texture, shapes, and kinds of materials used to produce the products are not considered in the discussion. 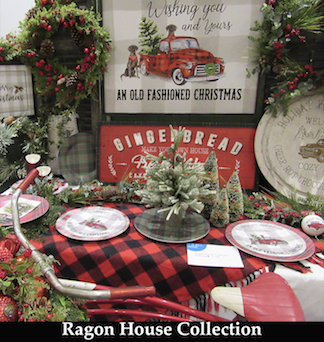 In the past Atlanta Gift shows, at least a few new trends were showcased in numerous showrooms each year. At last years shows, a slew of new trends such as vintage trucks/cars/bicycles, succulents/cactus, farm, llamas, and lake/camping were prevalent in many showrooms and on all kinds of products. But this year new trends were not apparent and gave the impression that there was nothing new. That was disappointing because buyers are always looking for new products for consumers! Buyers and artists that I talked to agreed with me that they did not see any new themes at the show. Instead the same popular themes from the past shows were used and the art was refreshed to give them a new look. Those that I talked to thought that the reason why there were no new themes is that manufacturers are concerned about the increased tariff in importing product that is raising the cost to produce products. Also the possibility of sales declining due to the apparent decline in economic growth could cause a recession. Thus, manufacturers are apprehensive in trying to sell products with new themes that are untested because they may not sell well. Those reasons may be correct or not, But, just using the same themes and refreshing them by changing the art and/or colors and not introduce new themes may eventually not be new enough to keep sales of products positive. Read Gifts and Decorative Accessories magazine trend spotters Alex Herring and Lenise Willis article “Trendspotting at AmericasMart 2019” to see a different viewpoint on trends. 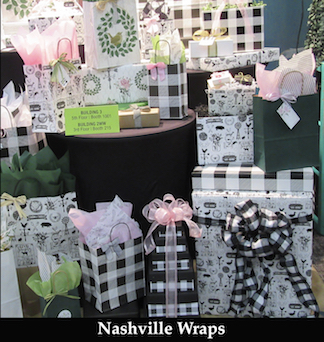 Discussed in the article are the following five gift trends they spotted at the show. 1. The color sage for fall with a muted color combination used for pillows, table runners and other household products. 2. Celestial craze/moons used for notebooks, socks, garland, and wall charms. 3. Terrazzo texture used for planters. 4. Botanical fronds, ferns, pressed leaves and exotic flowers used on many products. 5. Nursery gifts and décor that has minimalist designs and colors. Comment: The color sage has been slowly increasing in popularity for mostly fabric products. And, botanical exotic flowers and leaves are also increasing in popularity and seen at the show on many products. But the celestial trend can probably be considered a NEW TREND since it is now slowly appearing on other products even though it has been on wall art for years. In fact, Studio M/Magnet Works known for its outdoor garden products has expanded into giftable products that are inspired by elements of nature. 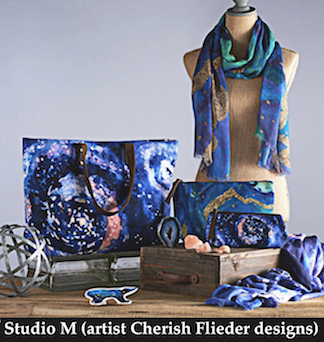 Their new line “Elements” created by artist Cherish Flieder is a celestial trend. See the picture below. 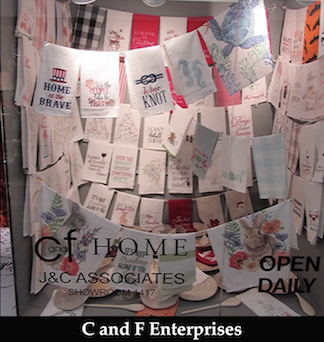 Also view Gifts and Decorative Accessories videos of interviews at the 2019 Atlanta show in the following showrooms: Studio M with co-owner Curt Todd, DEMDACO with artist Kelly Rae Roberts, CTW Home Collection, Amanda Blu, distributor One Coast that reps many companies, Ivystone, Ganz and Midwest-CBK. The Pantone Color Institute™ is a consulting service within Pantone that forecasts global color trends and chooses a color each year that symbolizes design trends and cultural mood. "For 20 years, Pantone’s Color of the Year has influenced product development and purchasing decisions in multiple industries, including fashion, home furnishings, and industrial design, as well as product, packaging, and graphic design.” according to the article "2019 Pantone color of year”. 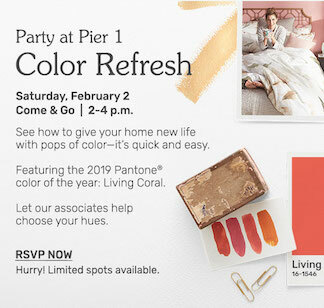 The use of Pantone colors for home furnishings is illustrated by the Pier 1 chain stores when they sent out a promotion about refreshing consumers homes with Pantone’s 2019 color of the year “Living Color”. See the promo below. Keep in mind that not all Pantone’s Color of the Year is a trend that will be seen on all products or used on all themes. 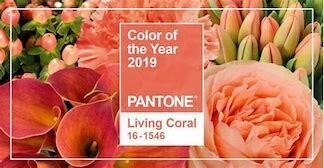 For instance, the 2018 Pantone Color of the Year “Ultra Violet" is not suitable for the coastal theme but this years Color of the year “Living Coral” is suitable. However, Ultra Violet color is use on fabrics for fashion and home décor. Thus, colors that are trending seem to depend upon the type of products and themes. 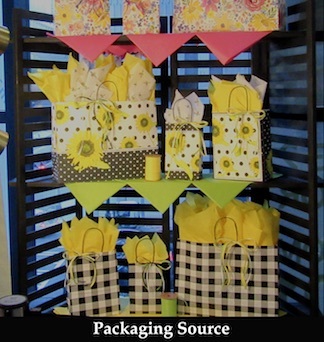 Packaging is one type of product that any color is suitable. In the above photo, the rose color (Fuchsia Rose) at the top was Pantone’s 2001 Color of the Year and still going strong. The combination of black, white, and yellow probably came from the popularity of the bumblebee theme that has been trending the last several years. The popularity of the black & white check plaid that is popular in the farm theme was clearly trending last year and is even stronger this year and seen on a variety of themes including Christmas. Themes that are consistently good sellers for products are considered to be evergreen (timeless). 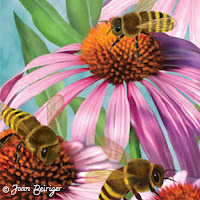 They include flowers; birds; insects (butterflies, bees, ladybugs, dragonflies); coastal and nautical images (seashells, lighthouses, anchors); exotic flowers, palm trees, birds, and leaves (fronds, ferns, flamingos, parrots); dogs and cats; roosters; turkeys; pumpkins; fall leaves; Santa Claus; snowmen; reindeer; and poinsettias. In current years, several other themes seem to be on the road to becoming evergreen; vintage bicycles and trucks, flamingos, and a variety of sayings on signs, plaques, and other products. Last year there was a spurge of newer themes including camping with vintage campers, lakes, farm animals, llamas, succulents and cactus, red and black check plaid (buffalo plaid), white and black/gray check plaid (used mostly with the farm theme). Increasing in popularity this year seems to be honeybees, flamingos with exotic leaves and flowers, white and black/gray check plaid used on all types of themes and products. A decrease in popularity in many of the showrooms seemed to be llamas, lake and coastal themes including mermaids. Below are photos and comments on some of the theme trends seen at the Atlanta Show. Inspirational and faith sayings, that includes quotes (repeat words from a book, speech etc. ), phrases (two or more meaningful words), idioms (not a predictable meaning), and quips (clever or witty comments) with or without art on the products are still VERY popular. But, not all buyers think so. I talked to one buyer who was looking for new products. She said that she could only sell so many signs with sayings on them. I am not sure if her comment meant that there were too many products with sayings on them or she could not find any sayings other than on sign products. However, I saw all kinds of sayings on products at the Mart. Sayings were not only on signs but also on journals, mugs, plates and serving trays, tea towels, pillows, and tote and gift bags, ornaments, clothing etc. Even though sayings on signs were still the most prevalent. Succulents and cactus products seem to be popular but not necessarily across the entire U.S. Some exhibitors (manufacturers) at the show that I talked to said that the majority of their cliental are not in the southwest were succulents and cactus are growing so they are not producing products with them because they would not sell well. Others said that they are selling well but those exhibitors were selling succulents/cactus figurines and not succulents/cactus art on products. Overall, I did not see that many exhibitors selling succulents and cactus except those exhibitors that were selling mainly outdoor products and those were figurines. Farm animals, barns, farm sayings, and white and black/gray check plaids are still very popular and on many types of products. The white and black/gray check plaids that were mainly on farm theme products last year have now spread for use on other themes such as flowers, dogs, harvest, Halloween, thanksgiving and even Christmas. Traditional colors of deep red and green is still popular for Christmas products. No new Christmas themes were seen at the show and Santa’s, snowmen, reindeers, moose, polar bears, poinsettias, pine needles, pinecones, and Christmas sayings were predominate. 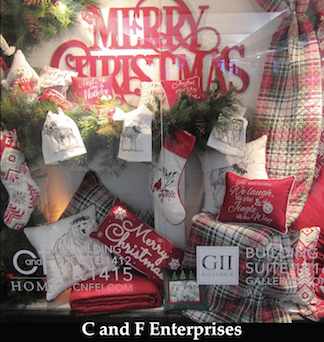 Last year vintage trucks and the use of red and black buffalo plaid were seen on all Christmas themes. This year there wasn’t as many. In place of buffalo plaids on products in most showrooms were different kinds of white, red and green plaids and white black/gray check plaids. Although the traditional Christmas look is very popular “some” manufacturers refreshed Santa’s and snowmen by dressing them in buffalo plaid and a few even in white black/gray check plaid. Buyers seemed very interested in purchasing Christmas ornaments from elegant shapes and bright colors to plain round shaped ones that had sayings on them. LED lights on products are not new but are still popular. They are not only on Christmas but also on Halloween and everyday products. They are used on wall décor, decorative flags, doormats, and more. Also they are used to light glass vases and other glass products. 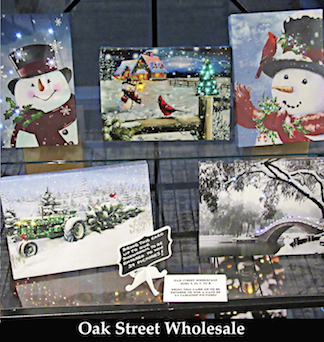 Note: In looking at the art style on the paintings shown in the above photo, Oak Street Wholesale “may” license the art. If you are interested in finding out if they do, you need to contact them at www.oakstreetwholesale.com.